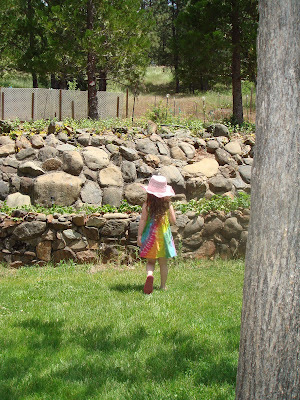 Strawberries and rainbow girl in July, 2011.
rainbow girl and strawberry bed in rock wall. My aunt had some wonderful strawberries this year with all the late rain. She has them planted in a long row along and edge of a long rock wall. It’s very unique, and old. The garden is above the rock wall, and you can access that from either sides of the wall via trails. Rainbow girl loves, strawberries, rainbows, mermaids, and paradise. She is a puppet maker, a movie star, and a ballerina. Strawberries are great in Weaverville.